ST. AUGUSTINE, Fla. -- St. Johns County's No. 1 industry – tourism – is experiencing record breaking growth, according to the county's visitors and convention bureau. At the Hot Shot Bakery and Café in St. Augustine, those numbers are reflected in the number of customers coming in. Sherry Stoppelbein, owner of Hot Shots, said, "St. Augustine is hugely busy. Crazy busy!" Stoppelbein just had a lucrative holiday which brought more business to her bakery. "Well, Nights of Lights is huge now! It's an international draw!" The tourism numbers are breaking records. Go back to September, a typically slow month in St. Augustine. September was anything but slow, in large part thanks to the 450th celebration pulling people in. "We had huge amounts of people in September," Stoppelbein recalled. "It was just unbelievable how many people were in this little tiny town!" According to the St. Augustine, Ponte Vedra, and the Beaches Visitors and Convention Bureau, occupancy at hotels in September 2015 was up 11 percent compared to the previous September. October was up 5.9 percent. November's numbers just came in, and they increased as well. 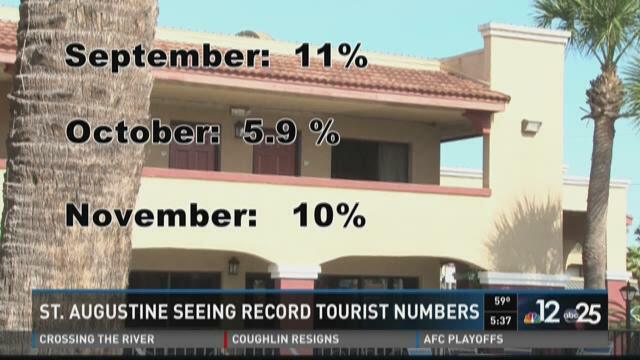 Occupancy at hotels in November 2015 compared to November 2014 was up 10 percent. Granted, this past September's numbers were good -- for a September. "Right! Those weren't July numbers. July our busiest month," said Richard Goldman with the St. Augustine, Ponte Vedra, and the Beaches Visitors and Convention Bureau. But no matter the month, when more people visit the city, it puts money into the pockets of those who work in the city. "When the businesses are busy, people are employed, they make a little more money, and it's generally good for the economy," Goldman said. January is another typically lackluster month, but some merchants expect tourists to fill the streets and business to be hopping. "We used to close a week in January because it was so quiet," Stoppelbein noted. "There's no way I can do it right now. It's just too busy!" And that's sweet news for a business owner who is okay if she never sees another slow month again.